Summer is here and I’ve been looking for dishes with light, fresh flavors. I’ve been enjoying my time off from school and had planned on doing a lot of cooking and baking this summer but I’ve been spending a lot of time with Baby J. This means I’m still finding as many quick and easy dinner recipes as I can. Fridays here are the farmers market. Actually I can go to the farmers market on Tuesday, Thursday, or Friday but the one in my small town is on Friday and I like to take Baby J and walk around. I pick fresh fruits and vegetables to use in our meals and also some fruits and vegetables for him to eat. I love using the organic and fresh picked produce for the baby. I can then feel good about what he is eating. This week I picked up a head of cabbage, a bunch of carrots, cilantro, berries, and lettuce. I had plans to use the cabbage, carrots, and cilantro in some type of Mexican dish. After looking through my recipes I decided to use them in Beer Battered Fish Tacos. When I think of Beer Battered Fish Tacos I think of a heavy entree. Anything fried and beer battered is heavy. 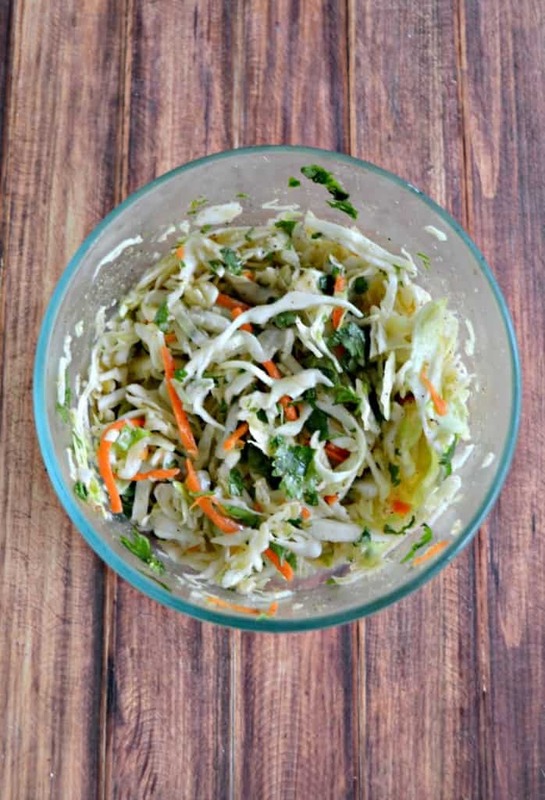 In order to lighten it up I made a fresh slaw with the cabbage, carrots, cilantro, lime juice, and spices. It was bright, crunchy, and totally tasty. The Beer Battered Fish were crisp and flavorful. 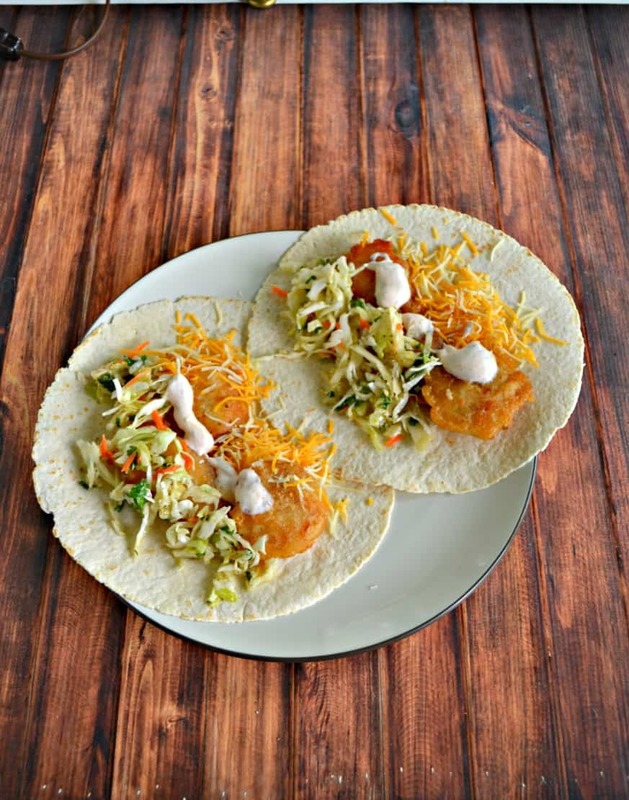 I placed them in a tortilla along with the light, crunchy slaw, salsa sour cream, and just a touch of cheese. These tacos were awesome! They were bursting with flavor and had a lot of texture and crunch. The slaw helped to lighten them up. While the tacos were lighter, they were still filling. I ate two and was totally satisfied. Crispy and flavorful beer battered fish nuggets wrapped in a tortilla with salsa sour cream and a fresh lime slaw. Combine the ingredients for the sour cream in a medium bowl. Mix well and refrigerate until ready to use. In a large bowl combine the lime juice, olive oil, honey, cumin, garlic cloves, cilantro, salt, and pepper. Mix well. Add in the cabbage and carrot and toss to coat. Refrigerate until ready to use. 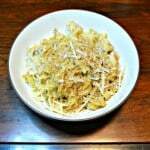 In a medium bowl combine the flour, garlic powder, chili powder, salt, cumin, and pepper. Add in half the beer and whisk. Add in remaining beer and whisk until smooth. Let rest for 10 minutes. To make the fish pour ½ c. vegetable oil into a saute pan. Heat until the oil is around 350 degrees. Working in batches dip the fish into the batter and then place into the pan. Fry for 4 minutes per side or until golden brown. 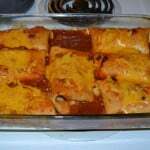 Remove from the pan and place on a paper towel lined plate. Repeat with remaining fish. Sprinkle fish with sea salt. 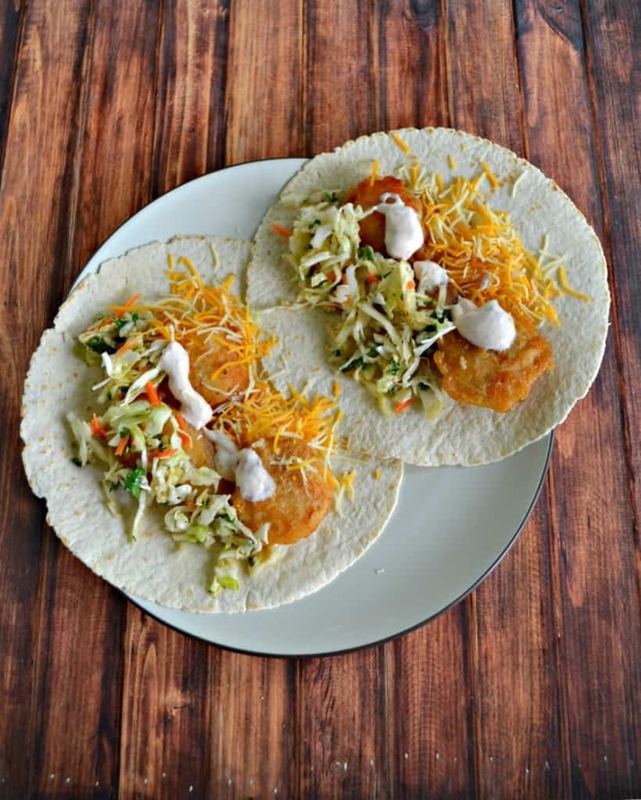 To make the tacos place a few fish nuggets in a tortilla, pour on a heaping amount of slaw, a tablespoon of sour cream, a sprinkle of cheddar cheese, and a few jalapeno rings. 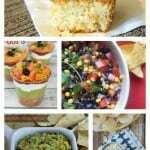 Recipe adapted from Rachael Ray Magazine June 2018.